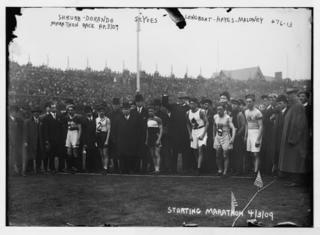 London, 1908: The world watched as three runners – dirt-poor Johnny Hayes, who used to run barefoot through the streets of New York City, an unknown Italian candy-maker named Dorando Pietri, and the famed Tom Longboat, an Onondaga Indian from Canada and winner of the 1907 Boston Marathon – converged for an historic finish at the 1908 London Olympics. At the end of the first-ever marathon measuring exactly 26.2 miles, an exhausted Pietri staggered into the stadium at Shepherd's Bush before 80,000 astonished spectators, including the Queen of England. He was the leader and needed only to complete three-quarters of a lap inside the stadium to win the gold medal, but the heat-addled Italian collapsed five times en route to the finish line. He was helped to his feet by sympathetic officials and managed to break the tape first, only to be disqualified for receiving aid on the track. The runner-up, Irish-American Johnny Hayes, was awarded the gold medal instead. In the immediate uproar, Queen Alexandra awarded a special cup to Pietri, who became an international celebrity and inspired one of Irving Berlin's first hit songs. Afterwards, the three runners turned professional and sold out Madison Square Garden and other venues in a series of big-money match races. Thus, the first worldwide marathon mania was born. 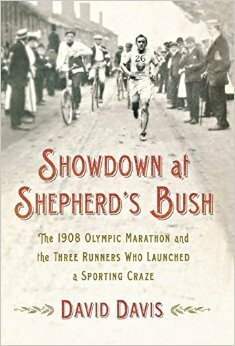 Recalling a bygone sporting era when pioneering endurance runners braved injurious roads with slips of leather for shoes, Showdown at Shepherd's Bush presents an invaluable and dramatic look at the dawn of modern sports.